Incapsula offers state-of-the-art security and performance to websites of all sizes. Through a simple DNS change, your website's traffic is seamlessly routed through Incapsula. Incoming traffic is profiled in real-time, blocking web threats: from SQL injection attacks to scrapers, malicious bots, intruding comment spammers and DDoS attacks. Outgoing traffic is accelerated and optimized with Incapsula's global CDN, for faster load times, keeping welcome visitors speeding through. Web Security: Enhances security with real-time and centralized security software. 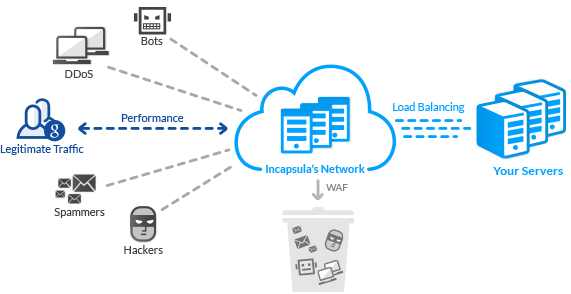 Web Application Firewall: Protects against sophisticated SQL injections, cross-site scripting and other threats. Website Performance (CDN): Doubles website load time and reduces bandwidth by half through geolocation coverage and CDN resources. PCI Compliance: Assists with PCI-DSS requirement 6.6 compliance (PCI Level 1 certification) and tracks compliance with automated reporting. DDoS Protection: Provides fast and cost-efficient DDoS protection. Website Analytics: Offers live traffic analysis, enabling you to recognize which pages are at risk and understand your target audience. Login Protection: Filters access with password authentication with ability to protect and authenticate at the page and/or application level. Affordability: Multi site protection with one package (SSL sites excluded). iWeb customers who subscribe to Incapsula will have a password and user name for the easy to use portal: http://my.incapsula.com/. Minimum contract length is 12 months. More information is also available on the Incapsula website: http://www.incapsula.com.